On the 18th of August I was in the city of London, UK for the 2nd Annual Street Hunters Meeting that was sponsored by our friends at COSYSPEED. You can read more about how that turned out in our “Street Photography Workshop & 2nd Street Hunters Annual Meeting in London” post we published on September 7th. Pretty much every detail of the 2 day event has been documented in that post for you to read. We had a wonderful time! Today we will be focusing more on the video we recorded on the actual 2nd Annual Street Hunters Meeting day which was on the 19th of August. Thomas Ludwig the face of COSYSPEED and Xavier El Javo Buendia one of the Streethunter.net Readers and myself all stayed at the same hotel. So we arranged to have breakfast together that morning and then head out to meet the rest of the Street Hunters that would be joining. In what seemed like a blink of an eye, we were at the Victoria station meeting point where we found Kobe Ikram waiting for us. Shortly after that everyone else joined and our little team of Street Hunters was ready to do some shooting! This year we were Tom Jeavons, Jeffrey Efremis Sofroniou, Kobe Ikram, Brian Boyce, Alexey Ks, Forrest Walker, Andy Wasley, Xavier El Javo Buendia, Thomas Ludwig and yours truly. 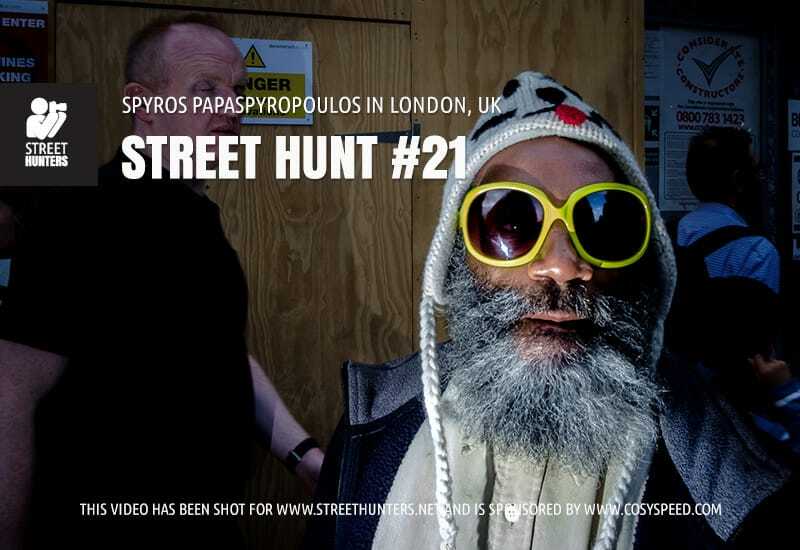 Before we started filming, COSYSPEED had a give away and handed out a limited edition Streethunters.net Camslinger Streetomatic bag to one lucky winner which in this case was Tom Jeavons. Last year’s Camslinger winner was also there Brian Boyce, sporting his Camslinger 160. After the giveaway ended, we all left and headed down Victoria Street. Unfortunately for us it rained quite a bit. You will see how much in the video! So we had to take cover. Feeling frustrated and wet, we decided to move into St. James’ Station and from there to take the underground to Waterloo. We hoped that by the time we reached our destination the rain would have stopped. It turns out we were lucky and it had stopped, well, it had slowed down at least. So we managed to properly start our Street Hunt! The hours that followed were packed with great fun and fantastic street photography experiences. We shot in Borough Market where the colours and the light was amazing, we tried our luck in the area around St. Paul’s Cathedral, we enjoyed an amazing lunch at a nice little pub Andy Wasley recommended, shot with a flash in Covent Garden, then Leicester square, Chinatown, Piccadilly Circus and finally Soho. There were 3 reasons why we ended the Street Hunt in Soho. Firstly and most importantly we were all thirsty for a beer. Secondly the Sony Action Cam battery was running low and had only about 15-20 minutes of recording time left, and the final reason was because it started pouring with rain again (which continued for hours and hours), making it impossible for us to continue recording anyway. The day was productive though and we managed to capture lots of footage and many photographs that I squeezed into a 38 minute video! For this Street Hunt video I used a Sony Action Cam to record video and my Fujifilm X-Pro1 with the XF18mm prime lens to shoot photos. The XF18mm is equivalent to 27mm full frame, so it is a wide angle lens. The flash I used is the Fujifilm EF-X20 and I connected it to my camera via an Interfit cord. This is my all time favourite gear setup that I use when I shoot in the streets and especially when I record Street Hunts. However since I recorded this video I have recorded one more handling both the Ricoh GR and the Fujifilm X70, so stay tuned for that soon! But now it is time to watch the video, so sit back, relax, grab a glass, pint, or cup of your favourite beverage and snacks and enjoy! If you want to check out each photo I have uploaded every image I shot in a dedicated Dropbox Album called Street Hunt 21.
awesome as usual! wish i was there!